Abstract. Methanesulfonic acid (MSA; CH3SO3H) in polar ice is a unique proxy of marine primary productivity, synoptic atmospheric transport, and regional sea-ice behavior. However, MSA can be mobile within the firn and ice matrix, a post-depositional process that is well known but poorly understood and documented, leading to uncertainties in the integrity of the MSA paleoclimatic signal. Here, we use a compilation of 22 ice core MSA records from Greenland and Antarctica and a model of soluble impurity transport in order to comprehensively investigate the vertical migration of MSA from summer layers, where MSA is originally deposited, to adjacent winter layers in polar ice. We find that the shallowest depth of MSA migration in our compilation varies over a wide range (∼2 to 400m) and is positively correlated with snow accumulation rate and negatively correlated with ice concentration of Na+ (typically the most abundant marine cation). 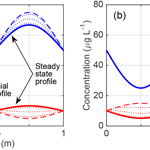 Although the considered soluble impurity transport model provides a useful mechanistic framework for studying MSA migration, it remains limited by inadequate constraints on key physico-chemical parameters – most notably, the diffusion coefficient of MSA in cold ice (DMS). We derive a simplified version of the model, which includes DMS as the sole parameter, in order to illuminate aspects of the migration process. Using this model, we show that the progressive phase alignment of MSA and Na+ concentration peaks observed along a high-resolution West Antarctic core is most consistent with 10−12m2s−1<DMS<10−11m2s−1, which is 1 order of magnitude greater than the DMS values previously estimated from laboratory studies. More generally, our data synthesis and model results suggest that (i) MSA migration may be fairly ubiquitous, particularly at coastal and (or) high-accumulation regions across Greenland and Antarctica; and (ii) can significantly change annual and multiyear MSA concentration averages. Thus, in most cases, caution should be exercised when interpreting polar ice core MSA records, although records that have undergone severe migration could still be useful for inferring decadal and lower-frequency climate variability. How to cite: Osman, M., Das, S. B., Marchal, O., and Evans, M. J.: Methanesulfonic acid (MSA) migration in polar ice: data synthesis and theory, The Cryosphere, 11, 2439-2462, https://doi.org/10.5194/tc-11-2439-2017, 2017. We combine a synthesis of 22 ice core records and a model of soluble impurity transport to investigate the enigmatic, post-depositional migration of methanesulfonic acid in polar ice. Our findings suggest that migration may be universal across coastal regions of Greenland and Antarctica, though it is mitigated at sites with higher accumulation and (or) lower impurity content. Records exhibiting severe migration may still be useful for inferring decadal and lower-frequency climate variability.